Four years ago today I moved into StuccoHouse. It's flown by....good & bad. Luckily my move happened on Halloween, or I would never remember the date. Of course the traditional celebration will take place this evening......a fun sized Snickers bar will be enjoyed by all. 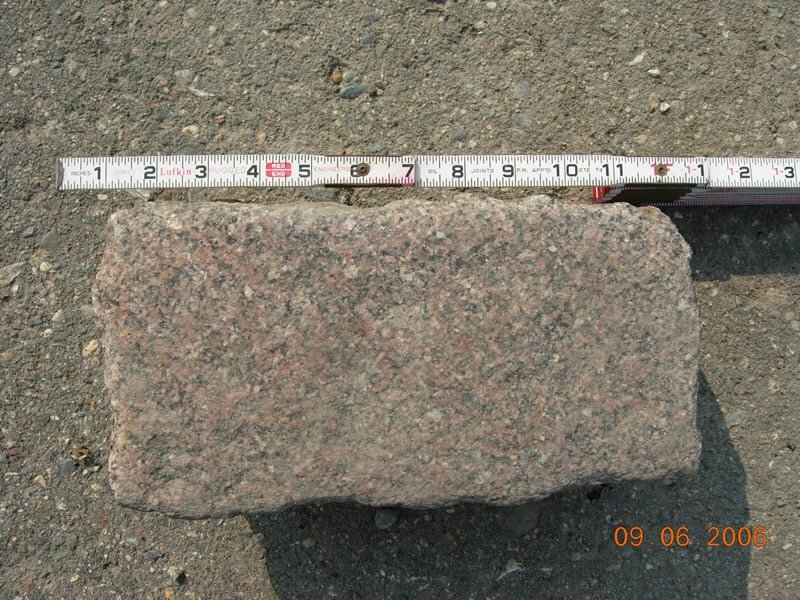 Back in the late 1800 and early 1900's the streets of Minneapolis were paved with granite cobblestones. Occasionally, you can still find patches of the old street. Sadly, whenever the city undergoes a big construction or road repair project, these old stones get dug up and hauled away. I've always been curious about this, and I know I'm not the only one that was watching the East Lake Street construction to see what was underneath the blacktop. So, I was intrigued when I discovered that the City actually sells the salvaged gray and pink granite cobblestones. You fill out one of these order forms, send it in to the City and they contact you with a time to come and pick up your loot. I have been toying with the idea of a historic cobblestone alley driveway. Ok, the guy from the second company I had out to give me a bid on replacing my main sewer line just left. I called two highly referred companies out to bid on the job. I checked licensing and BBB reports on both. I also talked to plumbers that have used both companies. Workers Comp & liability insurance has been confirmed. In initially speaking with both companies on the phone, I had a short lived optimism that maybe the drain wasn't as bad as I thought it might be and a good cleaning or spot repair might take care of it. But when both companies came out and looked at my nifty little sewer dvd, they confirmed that the sewer was pretty much shot. The 1924 drain tiles are 6" diameter and 2' in length and at every joint, I have roots entering the system. Not that you care, but I found it interesting that the top of each tile is painted blue and the bottom red. This works out well with camera shots because you can tell which direction is the floor even if the camera has twisted. Both companies suggested "sleeving" a 4" pvc through the existing 6" drain tiles. They could do this starting at the drain clean out pit inside my basement. The pvc, they tell me, is a 100 yr product that will be impervious to roots. Although I thought it was a little funny that when I asked about warranty neither company mentioned a warranty other than they would come out and make any adjustments necessary if something went wrong. The companies differ in how they would approach a "dipped" section of drain tile about halfway down the sewer line in the middle of my front lawn. My guess is that it is two drain tiles that have dipped - meaning about a 4 ft length of pipe. The dip looks to be maybe a couple of inches. One would clean out the sewer and then shoot the pvc through this section. They said the pvc had a tendency to "self correct" the dip. The other would dig a trench from above and remove those tiles and hand place the pvc in that section. Both bids agree that the sink hole down by the street is the great unknown. 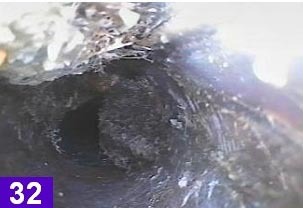 Because the camera was not able to get by that root blob, we don't know what the condition of the pipe is from the curb to the center of the street and the city's line. The first company would try to sleeve to the city main and only dig if the pvc would not go through. The other would plan to dig at this spot, remove the old tile and then pvc from this spot to the city line. I was impressed by one company that said they were going to call the city to see if the city had any info. on the condition of the lateral lines on my street. That same company also mentioned that my copper water line is in that same trench and would be covered if it was accidentally damaged. 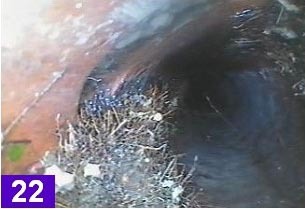 I talked to both companies about raising my inside drain clean out above ground - and both said they could do this. Not only would this make digging out dirt to reach the clean out unnecessary, it would also address some radon concerns I have had with that hole. I have one written estimate and the second one will be faxed to me on Mon. I get equally good vibes from both companies (which I have found to be gut instinct talking and oddly reliable). The first company gave me a bid where they sleeve from the house to the city line - with an added line item cost if they have to dig at the sink hole. The second company talked about a bid where they sleeve to the dip and then dig....and then they sleeve to the sink hole than dig.....and then they sleeve to the city line. From our brief discussions, I think one bid will be $500 or so less than the other. Both companies agreed that I have at least 30 days to mull this over before: a) the whole thing collapses; b) someone falls down my sink hole; and/or c) we get ground freeze which would make the whole thing more work & cost. Everyone else on my block has already raked up their leaves and have them sitting out in bags for pick-up. My tree will stay green until the day after the last leaf trash pick-up by the city. Then it will turn yellow and then red in a matter of a day and immediately drop all of its leaves. You have got to admire it's stubborn timing. I finally ordered the hardware for my salvaged storm door. 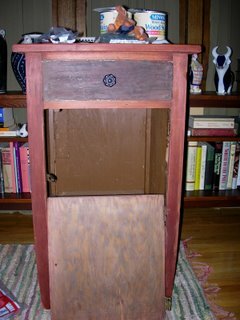 I've had the door stripped, repaired and primed for a while, but I didn't realize how hard it would be to find hardware in oil rubbed bronze. Seems that everyone that's anyone these days is using laquered brass on their storm doors. 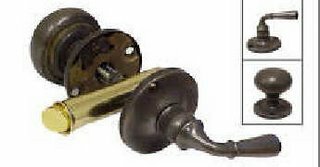 To complicate things, a lot of the more original storm door hardware designs are geared towards Victorians, not bungalows. 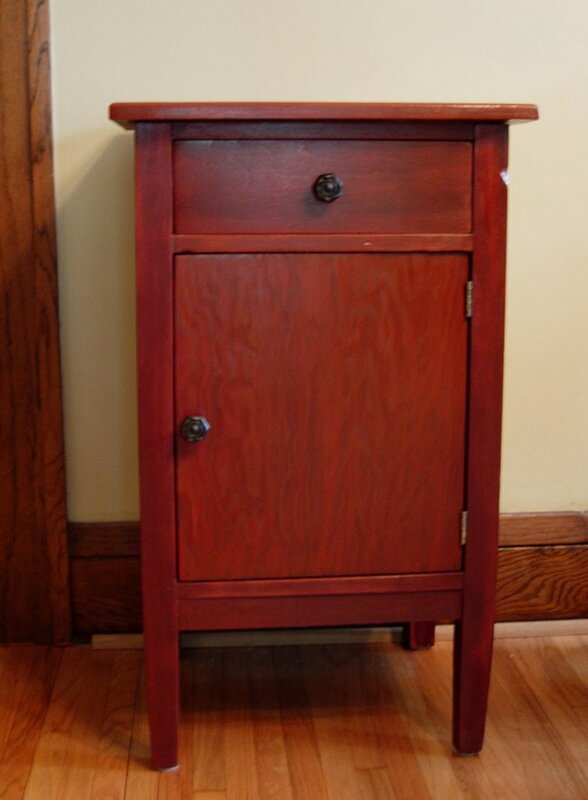 I knew of two places in town that sell the old fashioned style wood storms doors and also carried the hardware. I phoned the first place, Scherer Brothers lumberyard, and left a phone message - their message said they will call me back. They are on the other side of town and last time I visited their showroom I couldn't find anyone to help me. Plenty of sales people all busy with paperwork and their ipods. I wanted to make sure they carried oil rubbed bronze before driving over there. They never returned my call. I stopped by the second place. It is a custom woodwork place that I suspected was on the high price end. They showed me the set they sell. It was very nice. Made by Ives. $120. Ives is nice, but not top of the line, so I suspected this was a pretty high. So, I went online and found the same set for $68. Ordered it. Of course, its on back order, but is scheduled to arrive later this week. 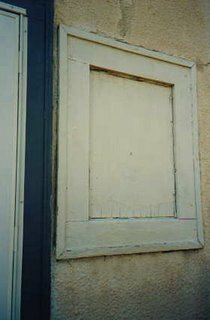 If the snow holds out and I can actually find a handyman that is not booked solid until next Spring, I may get this door in. We have rain and snow scheduled for the next week. After that, just general cold. So, this weekend the entire neighborhood was out en masse to finish up whatever they could before the snow falls. Everyone on my block was out raking up leaves, except me. I am (still) working on my front door trim surround and front door overhang. 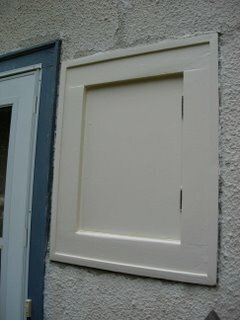 I got the door surround primed and the overhang painted. But there was one section of trim on the overhang that still had some stubborn layers of old paint. So, I pulled out the nasty, liquid (yet, very effective) paint stripper. I was up on my ladder and working overhead. I was too lazy (and, yes I will admit, vain) to wear safety glasses. I was slathering the goo on the trim when it happened. A big blob of stripper dropped right into my eye. I dropped everything and ran into the house and to the bathroom. All the way I was thinking "Oh, this is just great. Now I'm gonna have to come up with the money for a new sewer and an eye operation." I rinsed my eye out for about 5 minutes with water. Then took out my contact (which probably saved me). The area around my eye is a bit tender, but everything seems to be working fine. We (meaning me) learned a little lesson today. Safety goggles. A good thing. I'd much rather be posting pretty pictures of work being done on my kitchen or my storm door being installed. Instead, today I get to post photos of the inside of my sewer. Yea, just my luck. It finally dawned on me that a sink hole in my yard and drains that were starting to slow were not going to go away. Besides that, snow is coming soon. Lots of it. If my drain was to collapse this winter, it would be ugly. Really, really ugly. 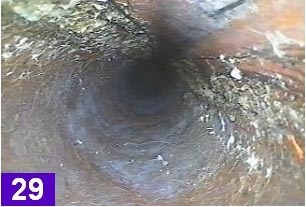 I figured it was best to know one way or another what the condition of my 82 year old sewer lateral line actually is. So, this afternoon I had a local company that has cleaned my sewer line in past years, D.C. Annis, come out and send a camera down my sewer (hey, Mike & Ryan). If it didn't end in me spending a kajillion in replacing my old line, I actually would have enjoyed it. (Well, I kind of did anyway - it was pretty interesting). Turns out I have roots running the length of my line. At about 45 feet, we ran into a 3/4 block of the pipe and had to stop. This is most likely about the spot where my sink hole has appeared in my front yard. The old drain tile has dipped in a few spots and water is standing. It also looks like it has shifted out of alignment in a few other spots. One section that has dipped is completely submerged in standing water. I could have it cleaned again, but my fear is that it would actually collapse and then I'd have to make an instant replacement. Anyway, without further ado...for your viewing pleasure...my sewer drain. I've posted the photos from good to bad. I actually have an 8 minute video to view. What has happened to the concept of good customer service? Where did it go? I vaguely remember it. A few days ago my mom & I took the afternoon off and drove to Jordan to one of the well known apple orchards. She wanted apples for eating & pies. I wanted apples for crabapple jelly. Where do you get apples fresh from the tree? An apple orchard, of course. Well, I got my 5 pound bag of crab apples home and opened it up to make jelly. Much to my surprise of the 5 pounds in that bag, 4 of them were rotten. We are talking covered in mold and mushy rotten. I emailed the company and told them of my problem. They agreed to send me a bag of replacement apples. The apples arrived. Can you believe it - they were rotten too! Now I can understand an occassional bag going bad, but if you were going to spend the money to overnight a bag of apples to someone that had already been disappointed, wouldn't you check out the bag you were going to send? On Wednesday I brought my car in for an oil change. I had a coupon, so I brought it to a dealer. They told me it would take 30 minutes. About 45 minutes later they called my first name. I went up and they handed me an invoice, which I paid. I went out to pick up my car and they pointed me to the wrong car. Long story short, they got invoices confused. It took another 15 mintues to straighten it all out. They gave me a coupon for a free oil change and then let me loose on the highway during rush hour. Yesterday I made trip to Home Depot to pick up some soffit vent covers. The 16 yrs old in the orange vest had no idea what I was talking about. He was sure they were in plumbing. Enough said. Moments ago I stopped at my local coffee shop. I make an effort to support the local stores instead of, say, Starbucks. I plunked down my $3.50 for a latte. I was the only customer in the store and there were three men (one, the owner) working behind the counter. I went to the "pick up" counter to pick up my drink and there I stood and watched a group of other customers come & go. When the three men were standing behind the counter chatting, I finally asked if my latte was coming. Good grief. They forgot. I was standing there. And they forgot. I was the only freakin customer in there. Did I get a nice apology? No, they told me their computer was down and I got a mumbled "have a nice weekend" and they went back to chatting. Screw that, next time I'm going to Starbucks. And the sad thing is that it has become so common place that we accept it. When we actually get adequate service we are astounded. And only rarely does non-stop bad service send us over the edge and into a meltdown (which obviously happened to me today). I think we have become immune. I like old furniture. What I really like is the scraggly stuff that has been painted a bajillion times. Over the years I've become pretty good at spotting pieces with "potential." 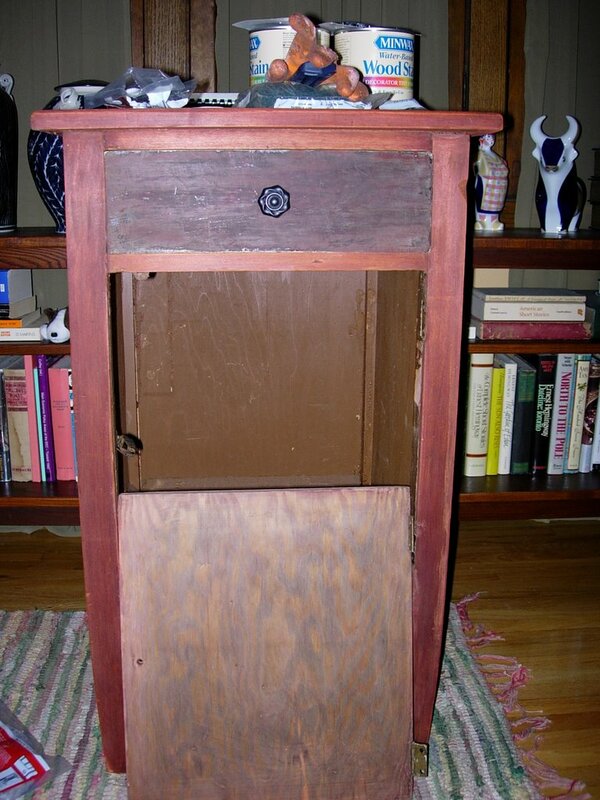 A little over a year ago, I found a little telephone stand for sale at one of my favorite antique places. 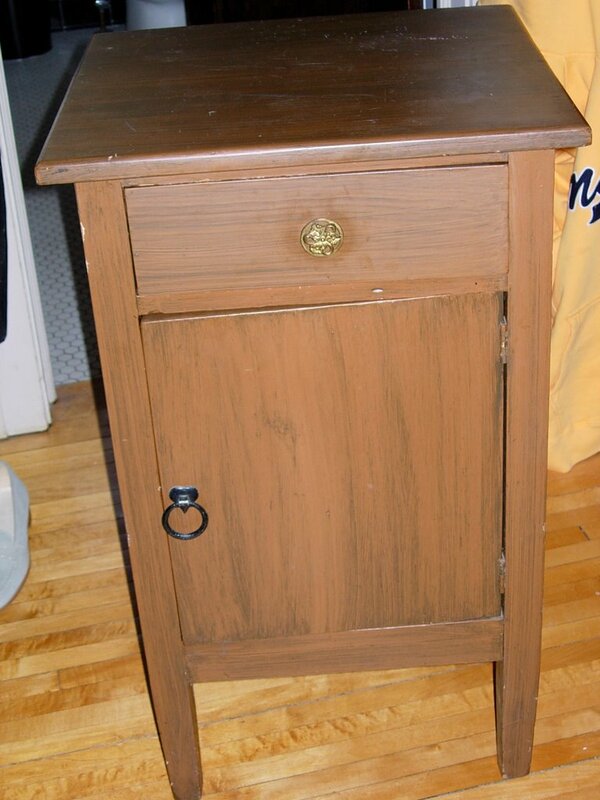 It was painted brown with an oh-so-attractive faux wood grain. In place of the original hardware a beautiful, gold gilded pull and equally lovely, heart shaped pull had been added. Underneath it all though, was a very solid (and really, really heavy) hardwood. I talked the owner into selling it to me for $28. I figured that even if I removed the paint and it was still hideous, I wouldn't be out much. So, I started to remove the many layers of paint. I expected to find oak. What I found surprised me. First, it wasn't oak - although I'm not sure what species the wood actually is (maybe elm). Next instead of being stained in a typical brown, it was stained in a very folk art red and green. It is pretty clear that this little piece was handmade. It took me forever to get off all of the paint layers. Then I restained using the original colors. I'm pretty pleased with the way it turned out. This one has me humored. 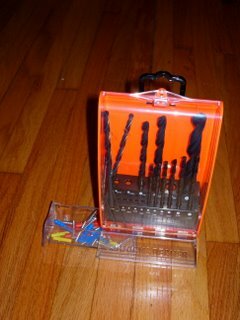 Who knew that on the other side of the country (well actually I don't know where he is, but it makes the story better) someone else bought the same Black & Decker drill bit set as I did and was also desperately trying to figure out how to get to the free screw anchor gift in the bottom of the plastic case?! This morning I found a nice comment on my blog from Adolfo, telling me he found my blog after doing a Google search on how to open the plastic case of the B&D set (I'm chuckling here - and also wondering why I didn't think to do that). And best of all, he knew how to open the case and was willing to share his knowledge with me. The internet (Google in specific) is a very good thing. So, is Adolfo. 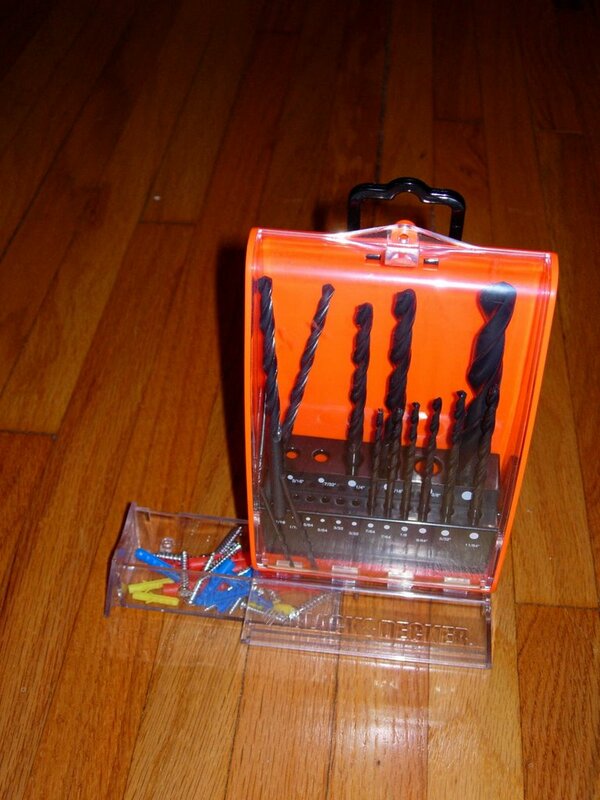 Behold folks, an open drawer to my free Black & Decker gift. Hurrah! 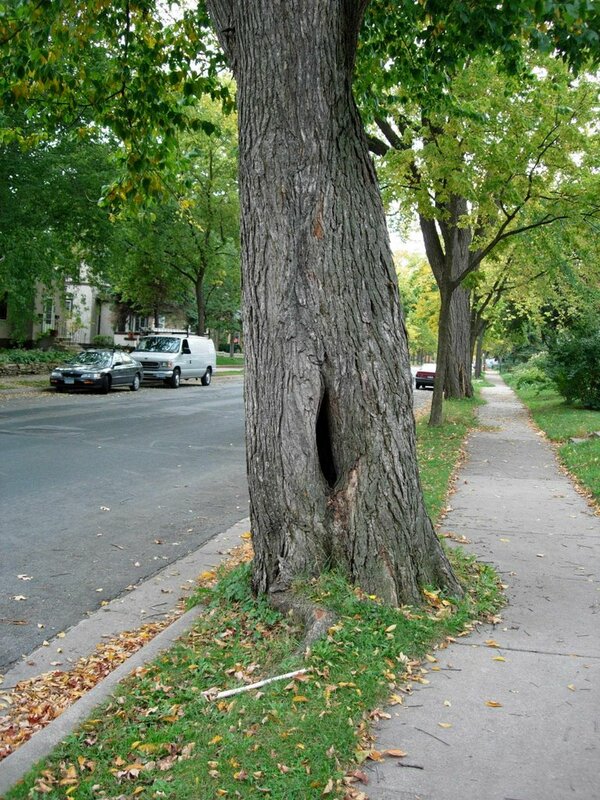 Minneapolis was once filled with elm trees. Elms were planted on both sides of many of the city's streets forming a nice canopy. In the summer, it kept the streets cool and in the autumn they gave a nice display of color. 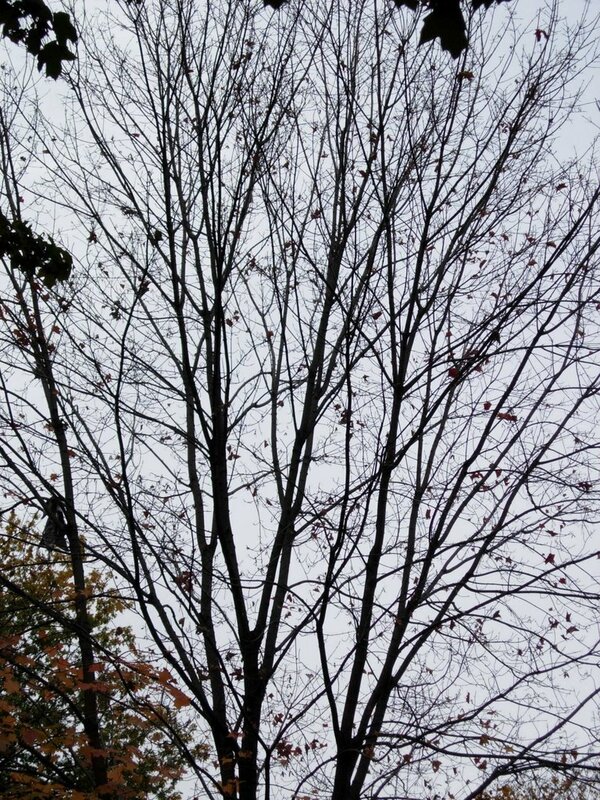 Elm trees grow quite tall and unlike other trees form a nice arch. 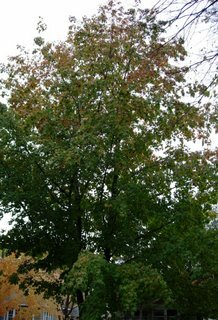 Interestingly, elms were chosen to line Victory Memorial Parkway, a tribute to those from Minneapolis who died in WWI, because the branches form large "V"s.
Enter Dutch Elm Disease. 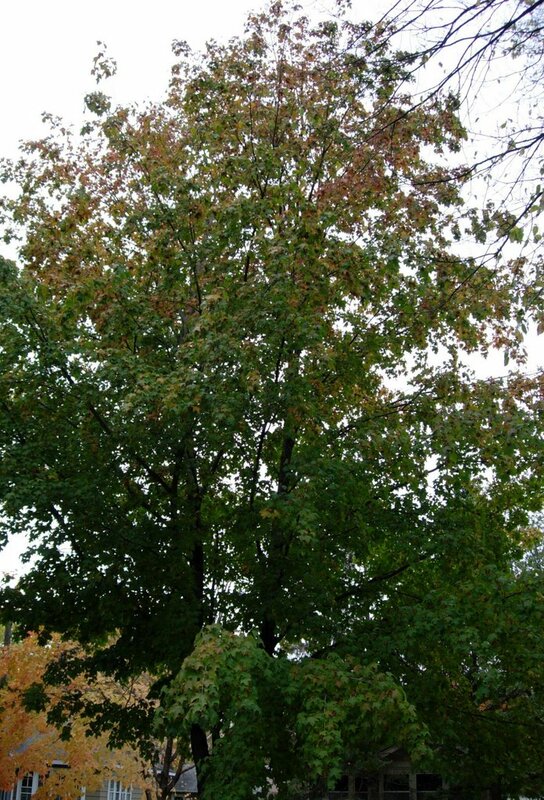 Beginning in the early 1960s and quickly spreading through out the Twin Cities, this disease has caused thousands of trees to be cut down. 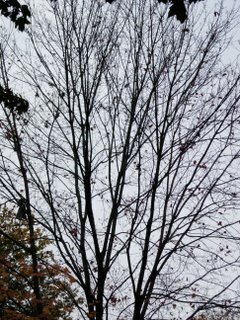 Streets that were once lined with elms have been now given another "designated" replacement tree (my street is maple). Every spring you see old elms with a bright orange spray paint circle around their truck and you know they have been scheduled for removal. A few weeks ago I discovered a garage sale (where I bought my salvage screen widows). Outside of the garage sale site bungalow was a big old elm tree. One of the last remaining on that street. There was a big hole in the trunk of the tree. I started chatting with the woman that owned the house and it turned out her parents had built the house back in the early 1920's and she had lived there (and the house next door to it) all of her life. They are planning to sell the house soon and move to Florida. She mentioned that she has so many memories of the house and the neighborhood. She pointed to the old elm tree and told me she remembered when that tree got its gash. The woman was 5 years old in 1949 and getting ready for kindergarten, when she heard a loud crash in their front yard. When the family got out to the front yard they saw a 46th Avenue trolley (long gone) had jumped it's tracks and crashed into their tree. It struck me that the tree will probably be hit by Dutch Elm in the coming years and cut down, and the woman is going to move to Florida and take with her some of these memories of the city. It's weird to think of the little bits of history that get lost this way. It may be a busy body thing to do but when that house sells, I may drop a note with the story of the tree in the mailbox for the new owners. For those Twins fans in the crowd (and who isn't? ), I thought I'd mention that the Riverview Theater in SE Minneapolis has kind of a fun idea. They will be showing the Oct 6th Twins v. Oakland playoff game on their big screen. If they handle it like past events, the show is free with the concession stand operating as usual. This is a 1940's vintage, stadium seating theater. The real deal; worth the trip just to look at the lobby. These showings are immensely popular, so if you want to see this playoff game (the one where the Twins win) with real buttered popcorn on the big screen surrounded by your fellow baseball fans, you need to get there early to secure a seat. Check the theater website for all the specifics. Strip ice delivery door of it's grayish white, bumpy, lead paint and and repaint. Show metal hinges. Check. So much for that being a quick little weekend project I could knock out. I'm thinking about switching the entire house trim to this creamy, light yellow. 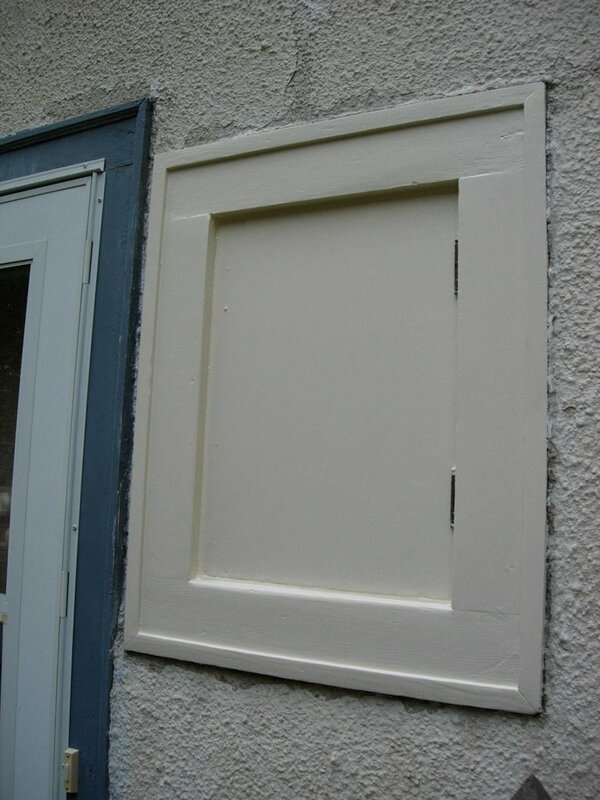 The current greyish white tends to look dingy with the stucco in its current state. I received a postcard from Mudd Lake advertising their Octoberfest Sale (print out coupon). It runs from Thursday Oct. 5th through Sat. Oct. 8th. On Saturday, they say they will have polka music and a pig roast. I've mentioned this place on my blog once or twice before. It's a fun place that carries many unusual things for house and home. More of a destination trip than a visit to a store, really. It's located in an old barn in Watertown, MN. This time of year it is a fun drive to see the leaves changing. I usually play hooky from work for an afternoon and hit at least one of their sales. The ups and downs of restoring a 1924 vintage bungalow in the Twin Cities, MN. Copyright © StuccoHouse 2004. All Rights Reserved.